The Last of his Tribe built a tiny hut in the garden he is cultivating in Tanaru territory, Rondônia state, Brazil. He is believed to be the only survivor of a tribe massacred by ranchers in the 1970s and 1980s. He lives on his own in a patch of forest, surrounded by cattle ranches and soya plantations. Very little is known about him. Extraordinary new footage of the last surviving member of an uncontacted tribe has been released by FUNAI, the governmental protection agency for tribal peoples in Brazil. The Last of his Tribe from Survival International on Vimeo. The man, known as the Last of his Tribe, has made it clear he wishes to avoid contact with mainstream society. His avoidance of interaction means that no one knows his story, but it is likely his tribe were annihilated by gunmen hired by colonists and ranchers who invaded the land from the 1970s onwards. From his abandoned campsites, we know he plants corn, manioc, papaya & bananas. He hunts too, and digs holes about 2 metres deep with sharp staves in the bottom to catch animals to eat. He makes houses of straw and thatch, and digs a hole inside, presumably to protect himself if attacked. 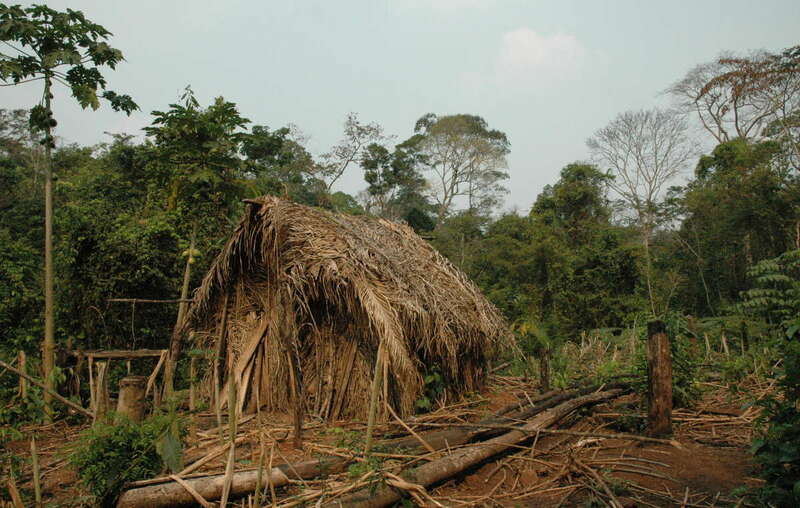 The Last of his Tribes house and garden where he grows manioc and other vegetables. Very little is known about this uncontacted Indian. He lives on his own in a patch of forest, surrounded by cattle ranches and soya plantations in the Brazilian state of Rondônia. 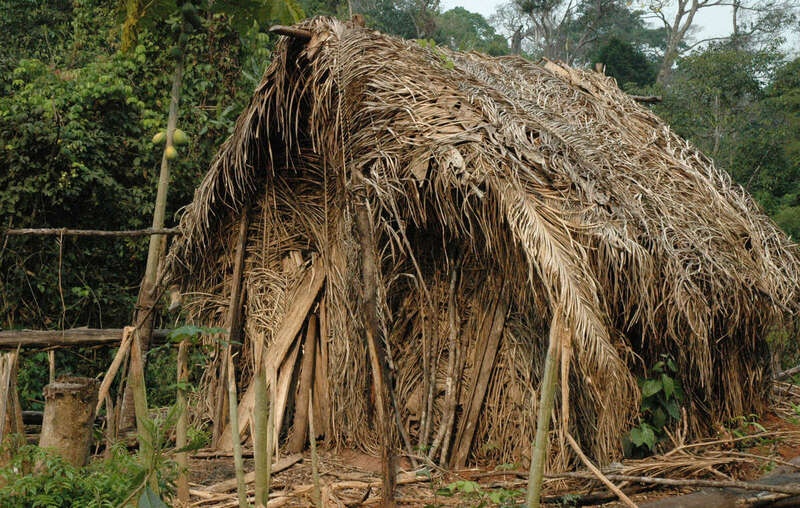 FUNAI became aware of his existence around 1990 after they found evidence of destroyed houses; the type of huts the man builds. Despite a targeted attack by gunmen in 2009, he has survived thanks to FUNAI’s enforcement of the legal order protecting his territory. This is now under threat. 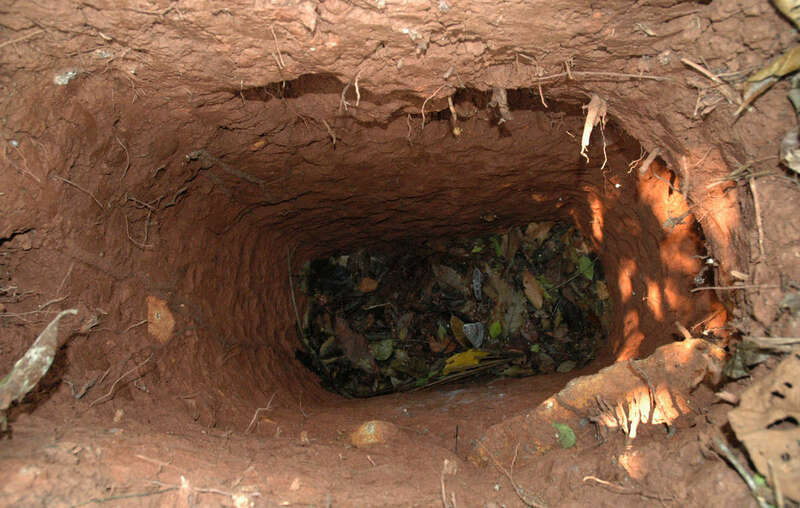 The man digs deep holes to trap animals and to hide in. He is believed to be the only survivor of a tribe massacred by ranchers in the 1970s and 1980s. This region is one of the most violent in Brazil, an issue likely to increase in the run up to presidential elections in Brazil this October, and FUNAI’s budget has been severely slashed. Survival International, the global movement for tribal peoples, has lobbied the government for years to protect his territory in the face of repeated attempts by surrounding ranchers to invade. 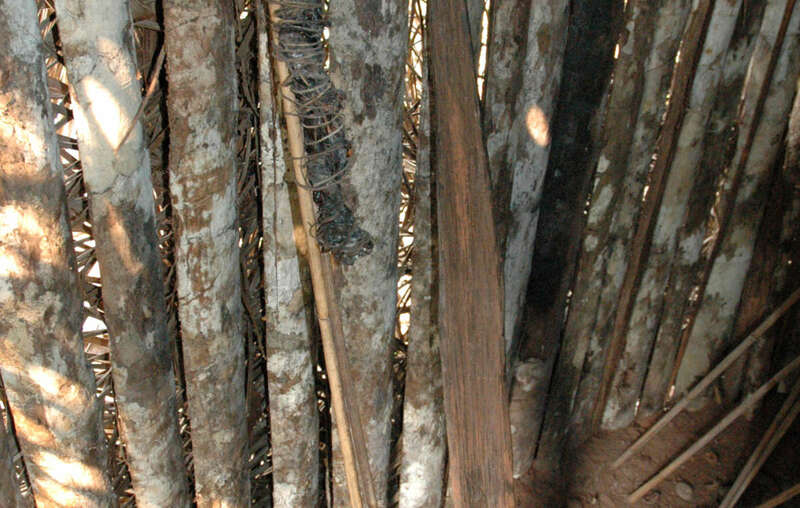 Resin torch and stake made by The last of his tribe, found by FUNAI in his house, Tanaru territory, Rondônia state, Brazil, 2005. Footage like this is vital in the ongoing struggle to protect uncontacted peoples, who are the most vulnerable peoples on the planet. FUNAI must prove he is still alive to retain the restriction order protecting his land, otherwise the ranchers who surround the territory will move quickly and violently to grab the land. 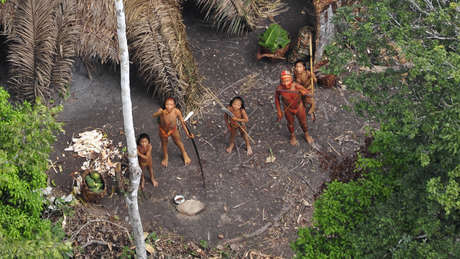 Stephen Corry, Director of Survival International says: “Uncontacted tribes aren’t primitive relics of a remote past. They live in the here and now. They are our contemporaries and a vital part of humankind’s diversity, but face catastrophe unless their land is protected. Survival International Research and Advocacy Director Fiona Watson has visited this territory during a government monitoring expedition. She has seen and photographed his huts and is available for interview on request. We can also provide additional images and the footage.